Whether you work for a corporation, or are an entrepreneur, your sub-folders might include Vendors, Marketing, Sales, Etc. Do you volunteer in your community or belong to professional organizations? The second step to Organize Your Gmail is to set up the folders (Gmail calls them labels) you think you’ll need. Click on the wheel near the top righthand side. Then click on Settings. The first option is “General”, the second option is “labels”. Click on Labels. Near the bottom of your screen is a button titled “Create New Label”. Click on that. Next create one label for each of the categories you specified above. For sub-categories, create another label which is”nested” under the main category. Once you have all your labels created it’s time to move your emails. Don’t worry! you wont be moving each individual email one at a time. You’ll be creating rules to properly filter each email as it arrives into your inbox. Open (or click on) an email that you would like to file. Then, click on the tag icon at the top of the email and create a label for that email. Next, click on the down arrow on the right side of the Search bar. Enter the email into the email box, or, if it is about a particular subject, enter that into the “Has The Words” box. Be sure to include quote marks if there is more than one word for your search. Then click on “Create Filter With This Search” at the bottom right of the window. A new box will pop up with your options. Remember to select the correct label for your selection. And, if you have a number of emails already which meet that criteria, click on the “Also apply filter to matching conversations” box. You have a number of other options here too. You can automatically file the email without it reaching your inbox, or you could mark it as important. Then, follow the same steps to Organize Your Gmail until everything is labeled and neatly filed! Please forward this to a friend if you found this helpful! It’s true. 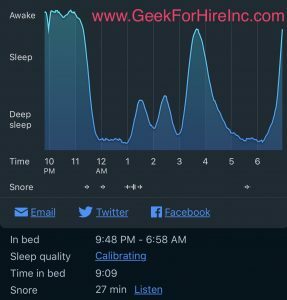 You can now use your iPhone’s Health App (and equipment connected to your iPhone) to track many of your body’s functions. For example you can track your heart rate, the Oxygen saturation in your bloodstream, or the number of steps you walk. If you have the iWatch, it can also track how far you swim, how long you stand, and other activities. The iPhone’s Health App will automatically track your steps, flights of stairs climbed, and how many miles you’ve walked, but you do need to always have your phone with you in order for the data to be accurate. If you synch your iWatch with your iPhone, you have access to additional data that is much more accurate. There are a number of apps that you can connect to your iPhone’s Health App to help you meditate and practice mindfulness. Calm: Calm has a few options available for free. Most of the meditations require a monthly, annual, or lifetime subscription. Calm also has bedtime stories to calm you down and help you to get a more restful nights sleep. Calm is rated 5 stars with 1482 reviews. 10% Happier – Meditation for Fidgety Skeptics: 10% Happier also has a few meditations available for free, with an option to purchase a monthly or annual subscription. It also has a meditation to help you wind down for sleeping. 10% Happier is rate 5 stars with 676 reviews. Headspace: Guided Meditation: Like the other two apps, Headspace requires a paid subscription to gain access to most of the meditations. It is rated 5 stars with 592 reviews. Unfortunately, I wasn’t able to find any great apps to track your food intake. The iPhone’s Health app does allow you to manually enter data which is very easy to do. If you take vitamin supplements, you can also enter the amount of Vitamin A, B, etc., that you are consuming. Don’t forget to drink lots of water every day! Have you learned more about tracking your health with your iPhone? If you found this helpful, please forward it! Wondering how to download a PDF to your Kindle? I have an ancient, first edition Kindle. My brother gave it to me years ago and I have had endless hours of reading pleasure with it. 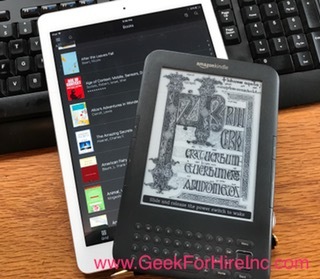 As technology has changed and Kindles have gotten better, I’ve stuck with my original version, primarily because I’ve downloaded the Kindle app onto my iPhone and iPad. Once you log in to your Amazon account, you’ve got access to everything in your Kindle library! I love real books; the smell of a book that’s been on the shelf for a year and I’m re-reading for the fourth time, the feel of them in my hands, the weight on my chest when I’ve fallen asleep reading, and the cool bookmarks I find and use. But there’s something very convenient about the Kindle. I can carry a couple of tomes on a trip without the additional storage issues. Another thing I like about the Kindle is that I frequently see free PDFs available to download. Sure it’s nice to have a free book, but if I didn’t have an easy way to read it, I’d pass. It took a while, but I’ve finally figured out how to download a PDF to my Kindle account and can read them there. Once you know your Kindle address, you can email those PDF’s to that Kindle address. Then when you open your Kindle or Kindle app the next time, you’ll be able to read the book! Know that Amazon does have a small charge for this service. The last time I uploaded four good size books, I was charged $0.90 for all four. You can also transfer the PDF file to your Kindle. You would do this by connecting your Kindle to your computer with the Kindle USB charging cable. Once the Kindle is connected, locate the Kindle folder using “Finder” or under “Computer”. It might show up as an external memory or hard drive. Once you know where the Kindle folder is, head over to where you have saved the PDF. I always save mine in the “My eBooks” folder. Highlight the file and copy. Head back to the Kindle folder and paste the file in the Kindle folder under “Documents”. Once the file is copied onto the Kindle, you’ll be able to access it on your Kindle or on the Kindle app from your Smartphone or Tablet. Remember to click the button to safely disconnect the Kindle! Now all you have to do is find a quiet time to sit down with your new book! If you have been reading my posts for any length of time, you know that my biggest bug a boo is privacy. Second, of course, is security. In hopes that others will want to learn a little about privacy, I’ve searched the interwebs for some of the best articles out there right now about why online privacy on your electronic devices is important. Who else besides me uses their phone for everything from buying coffee to checking Facebook to tracking steps? That’s a lot of info that goes out into the “cloud”. Is it safe? It’s important to remember that the onus is on you to keep your own data secure as these people who sued Facebook found out. They thought that once they had logged out of Facebook, it should not be able to track their browsing history. In this article, the Judge presiding over the case said no. And Alfred Ng reports in c|net that some of the bargain phones are sending info to a server in China. 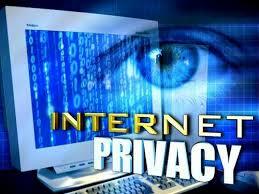 Privacy has become such an issue that the Supreme Court has agreed to hear a case later this year. This article in Reuters describes much of the case. “The case reaches the high court amid growing scrutiny of the surveillance practices of U.S. law enforcement and intelligence agencies amid concern among lawmakers across the political spectrum about civil liberties and police evading warrant requirements. The legal fight has raised questions about how much companies protect the privacy rights of their customers. The big four wireless carriers, Verizon, AT&T, T-Mobile, and Sprint, receive tens of thousands of requests a year from law enforcement for what is known as “cell site location information,” or CSLI. The requests are routinely granted. The Supreme Court has twice in recent years ruled on major cases concerning how criminal law applies to new technology, on each occasion ruling against law enforcement. In 2012, the court held that a warrant is required to place a GPS tracking device on a vehicle. Two years later, the court said police need a warrant to search a cellphone that is seized during an arrest.